From Jan. 24-27, instructors of Drum Corps International member corps and the DCI Board of Directors will meet in Orlando to consider 10 new rule proposals. DCI.org columnist Michael Boo breaks down each of the items that will be considered and gives his insight and opinions on how passage of each rule might affect the direction of the drum corps activity. Part IV of this series looks at one proposal to limit use of amplification to front ensemble percussion and another that would require corps members instead of staff members to operate sound boards. As pointed out yesterday, these three proposals are perhaps the first ever with the intention to undo prior rule proposals that have been voted in, a historically daunting challenge since rules have never been totally repealed. Limit amplification to front ensemble percussion instruments. This rule proposal asks that electronic amplification only be used with front ensemble percussion instruments and not be used for any vocal effects. percussion isntruments in the front ensemble, but also for amplifying the human voice. The elimination of amplified voice would not preclude the use of the voice, which has been legal for most of Drum Corps International's existence. However, the elimination of amplified voice would affect even shows that don't rely heavily on the technique. For example, the short snippets in Bluecoats' 2007 show..."Drop your weapons" and "You have the right to remain silent"...as well as the track announcer play-by-play in Carolina Crown's '07 "Triple Crown" show would be just as illegal as shows that have featured much more extensive narration. Granted, some will see this proposal as an end-run attempt to eliminate amplification, some will see it as an attempt to pull in the creative reins of show designers and others will think designers have gone too far and should be reined in. Shows that have featured vocal narration would be very different under this rule, or perhaps those shows wouldn't have been presented at all. Eligible marching members must operate the sound board. 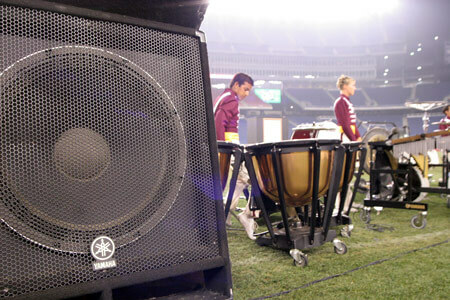 A year after the DCI Board of Directors voted to permit the use of amplification by corps, the allowance of sound board operation by non-corps members also was made. This was intended to allow for a more professional amplification output, since members on the field would potentially have difficulty hearing how the speakers were blending in each stadium's unique sonic environment. A rule proposal for 2008 has been submitted requiring that sound boards be operated by corps members, believing that everything that is currently judged in a performance isn't controlled solely by the performance of the members. A stipulation of the proposal also calls for prohibition of direct sound board coaching from staff members. This currently is permitted in DCI rules allowing for the person operating the sound board to "speak to a corps representative in the stadium, in the stands, and via phone or wireless device." If this rule were pass, and the corps member who operated the sound board didn't double as a front ensemble percussionist, finding someone to "march" who would have little to do during much of the rehearsal day might be a challenge. If a corps wasn't successful in finding a member to operate the sound board, or if the operator was taken out of commission during the season and no other members could be removed from their positions, that corps could find itself in a logistical bind, especially if the show depended on proper sound board operation.